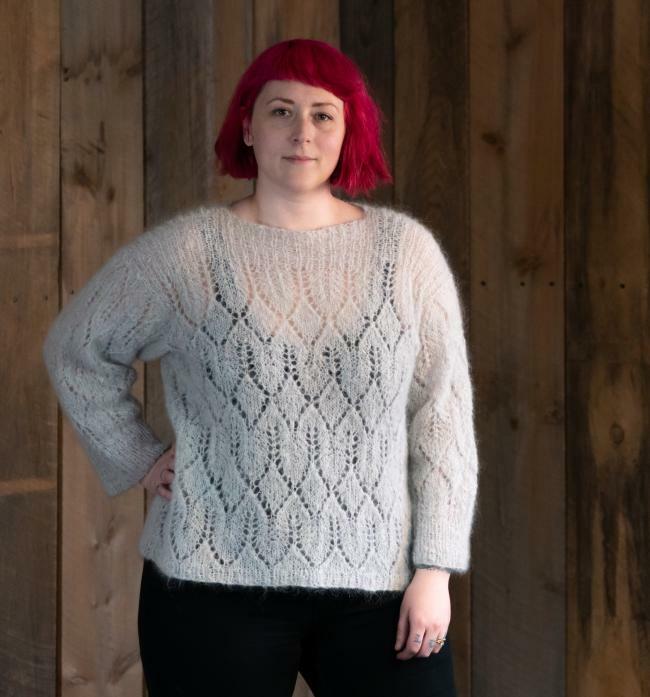 The Atmosphere Lace Mohair Pullover Sweater Pattern was inspired by the fluffy, ethereal mohair sweaters of the 1980’s, but with a slightly boxy shape and looser fitting wrist-length sleeves for a more modern look. This sweater looks great dressed up or down – try it with your favorite jeans, or pair it with something fancy for a special occasion! Sizes: 39 (44, 49, 54, 59)” bust, to be worn with 2-7″ positive ease. Gauge: Approx. 16 sts and 24 rows to 4″ in Lace Pattern using size US 8 needles, or size needed to obtain gauge. 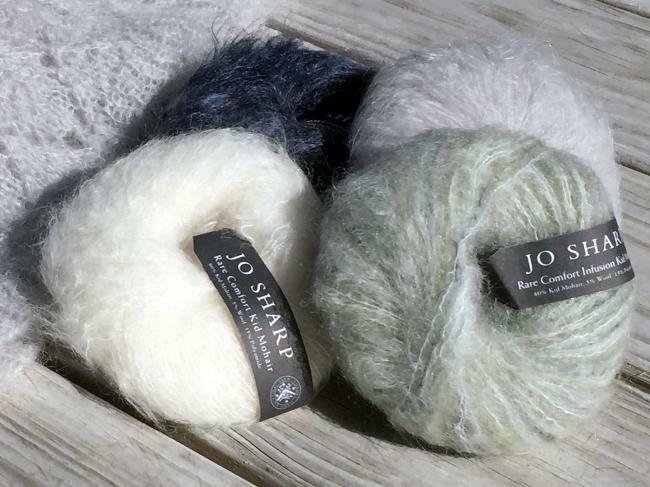 Atmosphere was designed to be an approachable lace project for knitters of many different levels. 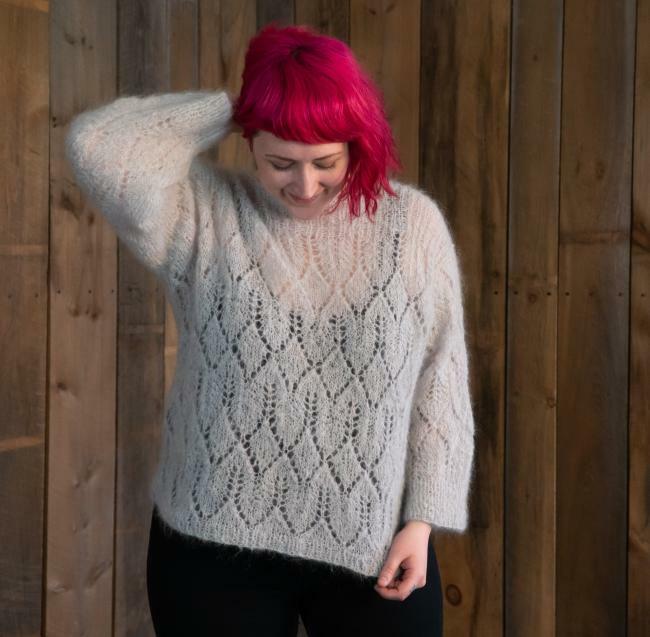 Beginning at the bottom hem, this sweater is knit in the round to the underarms, where you then divide to work the Front and Back separately to finish. Shoulders are joined, then sleeve stitches are picked up and worked in the round from armhole to cuff. 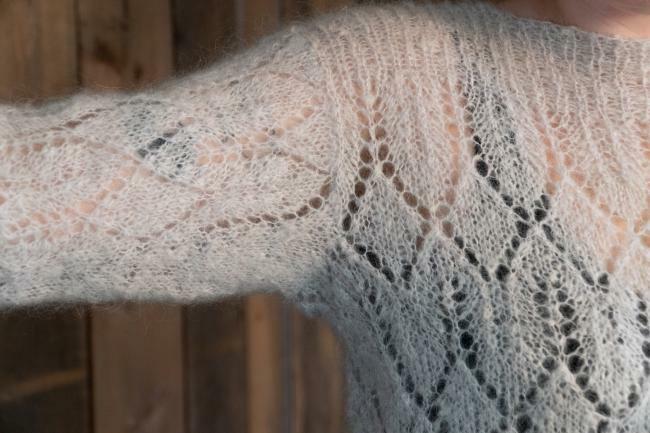 The sleeve shaping is worked within a Stockinette stitch section on the underside of the arm (shown in above photo), so you won’t have to decrease in pattern. Speaking of the lace pattern, I should also mention that it’s provided in both chart and written form. The model (that’s me) has a 40″ bust and is wearing the second size with 4″ positive ease. I loved how this sample size fit me, but I think if I make one for myself I will do the next size up so it’s a little roomier. 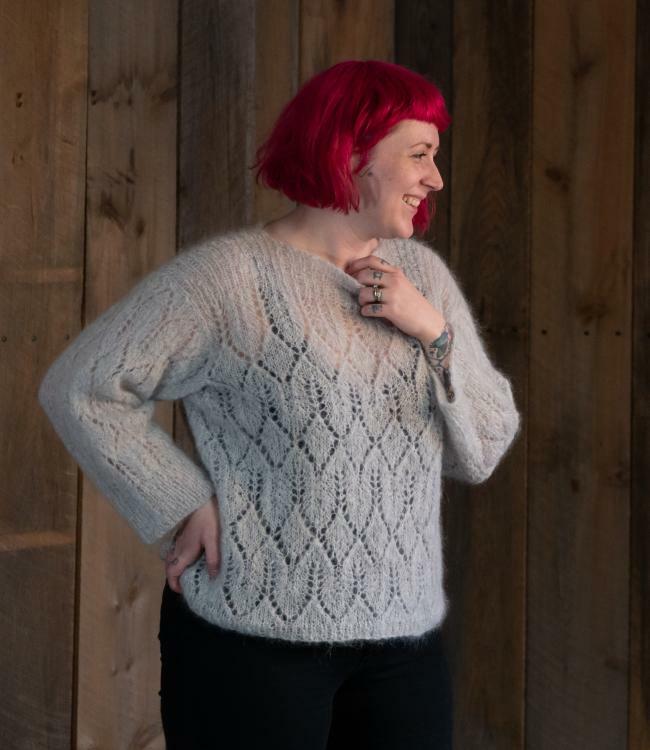 Either way, I still had a hard time deciding what to wear for these photos because this sweater really does look good with just about any outfit!